Buy this easy to use trap for young and old. It will keep you in crayfish for years to come. A section of the Trapper Arne inventory. 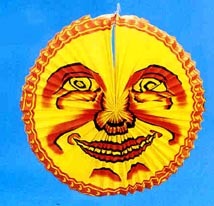 The unique shape of the XL trap shows up easily on this picture among Trappers, Trappys and Jackpots. 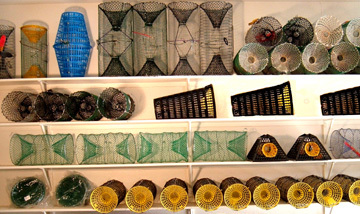 Even a few discontinued traps are shown as well as those Trapper Arne uses when crayfish catching. The XL trap is the favorite trap among crayfish trappers whose lakes have an abundance of crayfish. A bait box attracts crayfish through either of the two entry funnels. 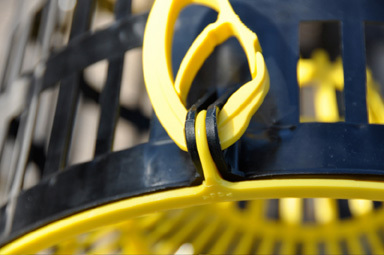 The trappy XL trap is made from sturdy polypropylene plastic that will outlast most of us. Because of its larger size and volume than the Trappy, it has stronger mesh for longer life. Thanks to its unique oval shape, the XL can be stacked to take very little space in the boat while fishing or in the car during transport. The XL is made in Sweden, so you can be sure it is very eco-friendly. The Trappy XL settles just right on the bottom and uses two entry funnels. 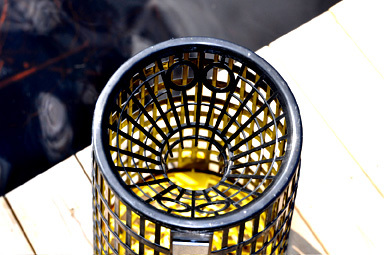 One entry funnel is YELLOW, perfect for fishing at night. The other funnel is BLACK, which is the best color for daytime fishing. Here a close-up of the clever QUICK-HOOK that comes with the XL. This hook can easily be attached and detached from the trap while emptying the trap of its catch. 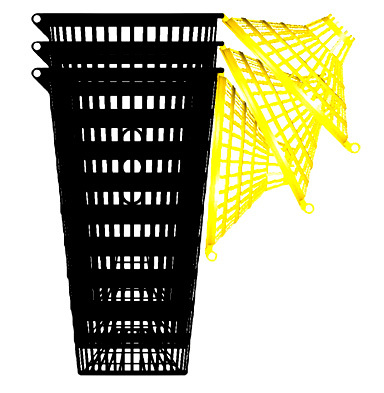 The XL trap is equipped with two sets of escape holes, one set in the black entry funnel (see picture). These holes make it possible for small crayfish to escape, leaving only the larger crayfish in the trap. These escape holes can easily be covered to keep both small and large crayfish in the trap. Here is a Swedish instruction video showing the Trappy XL. The few words spoken and words written are in Swedish until I get the international version of the movie. Enjoy anyway. 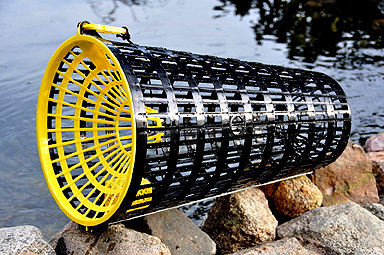 to buy the TRAPPY XL Crayfish Trap?